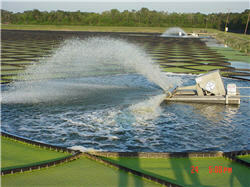 The Turbo X-Treme Aerator is a high-efficiency, floating/surface aerator, powered by an energy-saving 25 h.p. motor. It incorporates a “turbo” blower to achieve high-capacity water movement with maximum aeration and mixing incorporated in a discharge manifold. During operation, it raises the dissolved oxygen level in the water (in ponds, lagoons, etc..) while providing high-capacity water movement. The aerator is ideal for a wide variety of applications, including municipal, industrial, agricultural and disaster recovery. It is made of stainless steel, and carries a one-year warranty.